Hockey as a game has a lot to do with pace and constant happening on the field, repeatedly bringing the spectators on to the edge of their seats. Sadly GOLD, based on the sport, misses this important feature as a film and doesn’t offer any highly engrossing content in its majority of duration till it thankfully comes up with an impressive patriotic finale in its concluding half an hour. 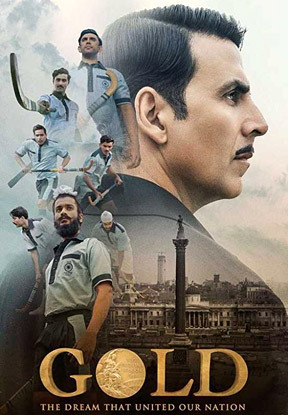 Neatly directed by Reema Kagti, GOLD honestly isn’t any great or outstanding film revolving around the first Olympic Gold won by the official Hockey team of the new, independent India in 1948. But at the same time, it also isn’t any bad film, a decent-above average film to be exact, which largely gets saved by its core subject, climax and the supporting cast instead of Akshay Kumar. Leading from the front, Akshay tries his best but the writing always presents him as a confused, dubious personality strangely mixing the job of a manager and a coach in a puzzling manner. Don’t know why the director asked him to be comic in his portrayal of the given character and why a Bengali babu suddenly starts singing a Punjabi based song in a party attended by all reputed people. On the other hand, GOLD shines due to Amit Sadh, Kunal Kapoor, Vineet Kumar Singh and Sunny Kaushal extremely doing well as a team providing an invaluable support. Beginning with an explosive sequence in the first 5 minutes itself GOLD takes the right start but isn’t able to maintain the excellence throughout due to many unwanted sequences and songs added just to satisfy the set image of its lead hero. For instance, the strange insertion of a monastery, an absurd daru song and repeated reference of the manager (Akshay) having a suspicious or unreliable character never lets you feel connected to him in anyway affecting the overall impact. Apart from its sluggish pace and the questionable characterisation, the film has loads of shortcomings in its execution and the biggest among them all is the over-fictionalization of the real life event which actually wasn’t the same as depicted on the screen (with all the names changed). And the problem is that now majority would think that it exactly happened in the same way as shown in the film. The forced and faulty spoken language becomes the second major drawback of GOLD that doesn’t allow both Akshay and Mouni Roy to establish any kind of noticeable connect with their viewers. In fact all the languages used in the film including Urdu, Bengali and Punjabi always looks like fake, particularly to the viewers who personally know the exact accent and phrases used. The extra length (due to unwanted songs & insertions) yet again forces you to think that why they always do that in such real life inspired films spiling the entire spirit? And then one also keeps remembering the much superior CHAK DE INDIA throughout, particularly in the film’s on-field sequences and the ones dealing with the team-politics. But above all, a sports film made on Hockey largely misses the excitement of the field and you don’t feel the energy except in the finale that truly saves the film from becoming a mostly dull fair. An apt cinematography, background score, editing and the song “Ghar Layenge Gold” also proves to the saviour, whereas VFX in this specific part of the film (showcasing the game) should have been better. However, what still makes GOLD an above average, decent watch is its informative subject enlightening you about our golden past, a fine production design recreating the gone era, an impressive supporting cast, an inspiring start and an equally striking culmination infusing a spirit of patriotism remembering the remarkable players representing the independent India in front of Bristishers and the world. But at the same time, I really wish we don’t over-fictionalise or sensationalize such real life events of the past, properly informing the new generations keeping the history as it is, without deliberately going for such big commercial deviations. Note: Following the same old exploitive practice, the ticket prices were yet again raised by the multiplexes for both the releases on the festive Friday. But this time the paradoxical catch reveals the hypocrisy as at one end they release their supposedly patriotic movies on the occasion of Independence Day. But on the other don’t care or even bothered when their films are sold at a higher ticket price looting the people of their country. On the contrary, the stars should have shown the guts celebrating Independence day by offering their films at reduced ticket prices from their side, and again not asking for Tax-Rebate from the government.....at least on the day of Independence as a contributing gesture. Anyway, continuing the tradition, a big one gets deducted from the ratings as BTC’s individual revolt against the timely rise in prices that nobody seems to be interested in, within the industry itself. Tags : GOLD Review By Bobby Sing at bobbytalkscinema.com, New Hindi Films Reviews by Bobby Sing, New Bollywood Movies Reviews by Bobby Sing, Hindi Sports Movies, Hindi films based on real life sports events. After watching the film, my son researched on Google and immediately questioned that if we won 4-0 in the finals, why are we shoing it to be 4-3? Why should we fictionalize history?? It was a dull and drab movie by al standards and all the potential of super fine drama based on reality is lost in stupidity of characterization and songs! Thank you for the perfect review yet again! Yes thats right as there were many more things fictionalised in the film playing with the facts and history. Probably they believe that purely history will not entertain the viewers or they are not able to make an entertaining film with all real historical facts. Anyway the loss is all ours as we get to know distored facts through such films.